MEF Network Foundations (MEF-NF) is a vendor-neutral certification, testing at a conceptual knowledge level on the major domains of software-driven networking, including SDN, NFV, Carrier Ethernet, other connectivity services and Lifecycle Service Orchestration (LSO). Numerous industry professionals require a concept level understanding of a broad set of contemporary networking topics, yet do not require in-depth technical training and/or certifications. MEF-NF validates at a concept, versus a deep technical level, the key terms, processes, and elements of today’s programmable networks, which makes it suitable for wide range of individuals seeking a recognized, foundational credential in networking. Target candidates include sales and product marketing professionals, OSS/BSS personnel, technicians and more technical professionals broadening knowledge beyond their current core competency. For example, a network engineer may want to gain an understanding of LSO as automation plays an increasingly important role in the networks of the future. MEF-NF is positioned as a foundation certification within the MEF Professional Certification Framework. Earning three certifications within the MEF Professional Certification Framework including: MEF-NF, MEF-CECP and MEF-SDN/NFV, earns industry professionals the coveted MEF NETWORK EXPERT status. The MEF-NF was developed to fill the need for those who market, sell, and support these networks to be familiar at a conceptual level with the elements, functions, deployment, and management of these networks. Prepare yourself to join industry stakeholders develop, deliver and consume new generations of dynamic services across automated networks. This certification exam presupposes foundational knowledge in networking practices. It is an entry-level certification examination for technical professionals asserting concept-level mastery of five knowledge concept domains: SDN, NFV, LSO/Orchestration, Carrier Ethernet and the Software-Driven Network Vision. Key components and characteristics of modern network technologies. The benefits, and what are the challenges in deploying software-enabled systems? Please see the exam highlights and the exam blueprint for more exam information. MEF Accredited Training Providers (MEF-ATP’s) offer training course and certification exams on a global basis. 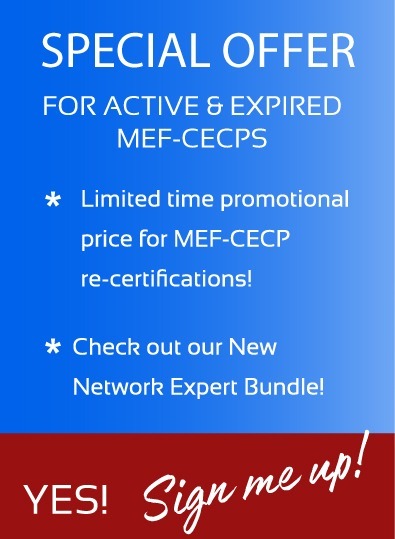 Click here for a list of MEF-ATPs and additional information. Over 90% of MEF Certified Professionals were formally trained by MEF-ATPs before taking an exam. Self-study is available to anyone and recommended only for those with multiple years of relevant networking experience or for advance preparation for a formal training offered by MEF-ATPs. Self-study sources include the MEF-NF Exam Blueprint and self-study options available through MEF-ATPs. Cost for this MEF Professional Certification Exam is only US$350.00. Re-take attempts (two within 6 months of first exam) are $100 each. Re-certification is required every three years at a cost of $300. Individual MEF-ATP's may bundle exam prices with training costs. If you already have foundation knowledge of the exam blueprint is a primary reference and is updated when a formal update to the exam takes place approximately twice per year. In that blueprint are key areas of study including reference materials. If you are not familiar with these technologies, the MEF Network Foundations (MEF-NF) training and exam is the place to start. Training providers are listed in the Education and Training resources on this site.